The RF Probe is one of the handiest accessories you can have around the shack. Using only 3 electronic components, it may rank as one of the simplest and cheapest homebrew projects. The one featured here cost about $10 in parts and supplies, not counting the wire, which I scrounged. When used with a high-impedance DC Voltmeter, it can be used to measure RF voltage (and power), trace RF signals in a new design, and troubleshoot malfunctioning RF circuits. It has its limits, of course, and we'll discuss those here. But once you understand how it's used, and how easy it is to build, you'll wonder why you never built one before. What's an RF probe, and how does it work? You might think of an RF probe as a special test lead that converts your regular ol' DC voltmeter to a RF reading voltmeter. Why not just read it using your trusty voltmeter, set on AC? Well, because most voltmeters wont read AC signals having a frequency above 10 or 100 KHz, and RF is way above that. [You can buy special RF-reading voltmeters, but they're very expensive... a homebrew RF probe is dirt-cheap]. Let's examine how an RF Probe works. Above left, we see the schematic of a classic half-wave peak rectifier, commonly seen in power supplies. It's pupose is to take an AC signal at the input (usually from a transformer or the AC line), rectify it, and charge a capacitor. If you don't take a lot of power from the circuit (i.e., if your load doesn't draw a lot of current), the capacitor charges up to the peak voltage of the AC signal, and stays prettty much constant. Notice the simplicity of the circuit: not counting the load, we see it is an AC Source, a diode, and a capacitor in series. Above right, we see a simplified schematic of the RF Probe. At first glance, it looks quite different from the circuit at the left. But notice: just like the first, it consists of an AC Source, a diode, and a capacitor in series. It's pupose is to take an AC signal at the input (usually from a circuit under test), rectify it, and charge a capacitor. And just like the first circuit, If you don't take a lot of power from the circuit (i.e., if your load doesn't draw a lot of current), the capacitor charges up to the peak voltage of the AC signal, and stays prettty much constant. In both these circuits, if we place a DC (not AC) voltmeter at the place where it says "+" and "-" we'll read a DC voltage that is approximately equal to the peak of the applied AC voltage. If we knew our applied AC was a sinusoidal signal (or sine wave), then we could divide our reading by 1.414 to obtain the RMS value, which is the way we usually measure AC voltages. Even if it's not a sinusoid, at least we know what the peak voltage is, and that's something we didn't know before we started. As we know from elemental electronic theory, the voltage across the second resistor (where it says "+" and "-") is equal to the applied voltage multiplied times the ratio of the second resistance divided by the total resistance in series. In our case, for a sinusoidal input, we know the applied DC voltage is equal to the PEAK of the AC voltage. We would like the resistor divider to divide by 1.414, which means that the total resistance in series (including the second resistor) needs to be equal to 1.414 times the second resistance. In our example circuit, shown above, the second resistor is 11 Megohms, and the total series resistance is 11 Megohms PLUS 4.7 megohms, or 15.7 Megohms. Is this ratio 1.414? Pretty close, about 1.427, closer than the typical resistor tolerances. But wait! I said we would add one resistor, not two! What's up with that? Well, the 11 Megohms is the typical input resistance of a high-impedance voltmeter, like an electronic VTVM or a digital voltmeter. As long as it's 10-11 Megohms, it'll give results close enough for government work (HI). Obviously, it's important to know what your voltmeter's input resistance is, and you can find this out in your voltmeter's specifications, or measure it (I wont get into that). And really, accuracy is often not that important, especially when you're signal-tracing. Enough! Let's get real... let's build something! 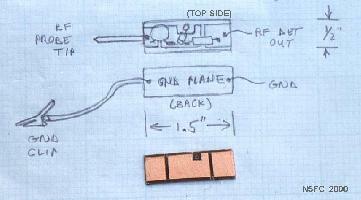 Here's a complete schematic of the classic RF Probe. Simple, eh? We've added a few things from our theoretical discussion that we'll make short note of. Obviously, for "probing" we need a "probe". (Hey! No wonder I get paid the big bucks...). We add a SHORT lead with an alligator clip. 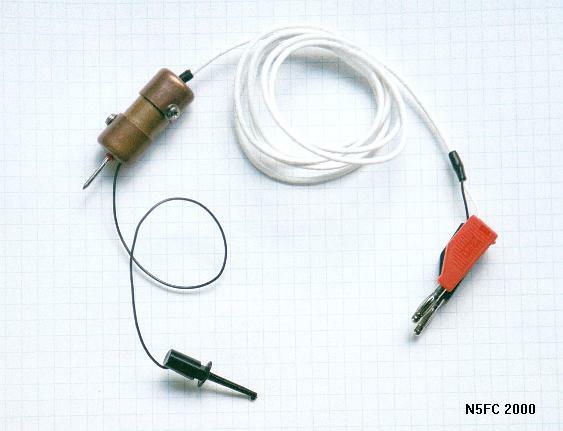 The alligator clip goes to our circuit "ground" and the probe goes to our test circuit, where we're probing. Brilliant! We don't want either of these to be long leads, because we're talking RF here, and long leads = antennas, and we don't want to be picking up stray signals or broadcasting them. 10-12 inches for our ground lead is sufficient for circuits to up to 30 MHz. As shown in the schematic, we'll need to shield the RF Probe circuit, or else our hand and body will pick up stray RF and couple it into the circuit, causing erroneous readings. We'll also shield our leads all the way back to the Voltmeter, as shown, for the same reason. At the far end of the shielded wire, we'll mount banana plugs (or whatever will fit our DC Voltmeter). In case you're tempted, don't make poor substitutions for the diode. We chose the 1N34A because it had the following key characteristics: Reverse Breakdown Voltage greater than 40 Volts, forward voltage (barrier potential) of less than 0.3 Volts, and good RF qualities. Any diode with these qualities (example, the 1N458A) would work as well, but the 1N34A is readily available (at Radio Shack and others). Silicon and Shottky (hot-carrier) diodes, while good RF devices, have higher barrier voltages, and will not work as well at low RF voltages. The 1N34A is a germanium device, and with a barrier voltage of around 0.25 V, provides about the best performance you can get with this simple circuit. 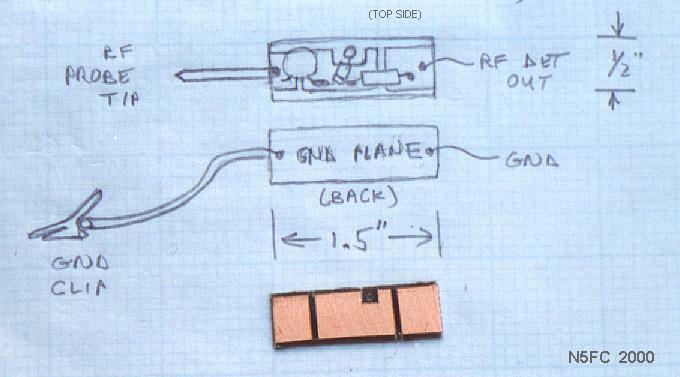 Take a small piece of scrap double-sided printed-circuit board, about 1-1/2 x 1/2 inches, Groove it on one side only, similiar to the image above, to create pads for soldering, but leave the back side as a "ground plane". Mount your diode, capacitor, and resistor as shown, soldering to the pads you made. One side of the diode (the non-banded isde) gets connected to the ground plane (drill a hole through to the other side and solder it). Try to fit all the components neatly inside the edges of the pc board. Solder the braid of the shielded wire (3-4 ft long) to the ground plane, and the center conductor to the pad with the resistor. Also, solder a 10-12 inch hook-up wire to the ground plane. Check that there are no shorts between the center conductor and the ground-plane. Solder the probe tip to the pad with the capacitor (I used a discarded probe tip from a broken test probe). So, how do we use this thing? Before we use it, a few precautions are in order. Don't use the probe in any circuit where the highest DC supply voltage is greater than the diode's reverse-breakdown voltage. For the 1N34A, this is 50 Volts. Same goes for the capacitor, which should be rated at least 50 Volts. This probably means that the probe cannot be used in most tube circuits. Also, don't try to measure RF power in circuits where the peak voltage will exceed 50 Volts. What will happen if you exceed these voltages by a little? Well, probably nothing; possibly, the diode or capacitor will fail open or short. The first thing you'll always do in using the RF Probe is to connect the banana-plug end to the +/- jacks of your DC Voltmeter; set the Voltmeter to DC-Volts (not AC). To use the RF Probe for signal tracing in a malfunctioning RF circuit or a homebrew circuit, connect the aligator clip to a convenient "ground" or "common" point in your circuit. Often this is the chassis. Most of the time, you'll be probing at the base/gate, emitter/source, or collector/drain of a transistor, one either side of a coupling capacitor or transformer, or at the input or output of an IC. Because the circuit's RF must overcome the diode's barrier potential (of 0.25V, for our 1N34A), voltages much less than that won't read at all, and voltages less than about a volt won't read very accurately. Typically, RF and post-mixer-amps in receivers don't have enough RF voltage, unless you inject a very strong signal at the input. I recently used my RF probe to troubleshoot my dead TenTec Scout, which had suddenly quit transmitting in mid-QSO. I connected the rig to a dummy load, then keyed it while probing. Using the probe, I was able to follow a steadily increasing RF signal through the transmit chain, from the oscillator through the transmit mixer, to the pre-driver, and the driver. The actual voltage measurements weren't important, just that they were increasing from stage to stage where expected. Then, (whoops!) the driver's base circuit had 6 Volts, but the collector circuit only had only 0.1 Volts! The driver transistors had gone south! For example, I want to measure the power out of my TenTec 1340 40-Meter QRP transceiver. I place it on a 50-ohm dummy load, and key down. I generally use a BNC-Tee adapter to gain access to the output line, but I could as easily pop the cover off. Using the RF probe (alligator clip to chassis ground), I measure12.2 Volts (DC) (and the same RF RMS Volts). Plugging this into the formula above I have PWR= (12.2 + 0.25) * (12.2 + 0.25) / 50 = 3.1 Watts. The rated power for this rig is 3 Watts, so I've verified everything is hunky-dorey. We've added the potential barrier to the measured voltage above, but that little trick doesn't work so well when you get down around a volt, and for voltages less than about a volt, the measurement accuracy suffers greatly. Also, the diode's response is severely non-linear below the barrier potential, and will generally read much less than expected in circuits where the RF voltage is less than 1/4 volt. So if you see tiny readings in circuits where it's normal to have voltages less than 1/4 volt RF, don't get too spun-up about the low readings... it may mean everything is normal. My rule of thumb for guessing at this is as follows: For collector/drain circuits in oscillators or transmit-chain amplifiers in key-down, expect RF Voltages about 20-50% of the applied DC (supply) voltage. This depends on the circuitry, of course, but it's a reasonable gesstimate. Base/gate and emitter/source circuits will generally be much less, maybe 5-10%. Circuit impedance will affect this too. Well, we're not talking high performance test equipment here, but we are talking very useful. If you account for the barrier voltage, the readings can be quite accurate when measuring most low-impedance circuits (20-200 ohms), provided that the voltage is above 1 or 2 volts. How accurate? +/-10% from 200 KHz to 150 MHz would be a reasonable expectation. Also, the voltage divider is only accurate for sinusoidal signals. If you want "peak" measurements, simply multiply your reading by 1.414. The "peak" measurement should be good regardless of whether the waveform is sinusoidal. Regarding ultimate accuracy, your results may vary, and you may want to compare it to a laboratory instrument at the frequency of interest if you're really interested in accuracy. If you shield it well, and keep the ground clip lead reasonably short, it should be good in low-impedance circuits up into the VHF region, and down into the upper-audio region. In higher-impedance circuits, the junction capacitance of the diode may cause a low-pass effect at higher frequencies, and you're most likely to see this as a loss of measurement accuracy (i.e., low readings) at frequencies above 30 MHz. This doesn't mean it's not useful; it just means it reads low. Also, the capacitance of the probe may affect some sensitive RF circuits. For example, if you're probing a LC-tuned oscillator circuit, it may stop oscillating or change frequency or become unstable. Actually, most any probe will do this. Also, as we said before, the barrier voltage becomes a bigger part of the measurement error as the circuit voltage drops below a volt or so, and becomes dominant as you approach the barrier voltage. Just keep this in mind as one of it's limits. Enjoy, good luck, and 73!